What Causes Brittle Toenails with Ridges? The status of our health can be determined by our nails. Strong and durable toenails indicate physiological wellbeing. On the other hand, brittle and ridged nails indicate systemic disease, nail injury or poor underlying health. In some cases, ridged nails may have no discernible cause. Given the number of risk factors, it can be difficult to determine the reason for nail abnormalities. However, studying the type, color and location of the ridges can narrow down the list of causes. We’ll explore the various causes of toenail ridges and brittle nails so that you can determine what is wrong. We’ll then look at whether it’s possible to get rid of toenail ridges for good. 1 Why Do I Have Ridges on My Toenails? 1.1 What Causes Horizontal Ridges on the Nails? 1.2 What Causes Vertical Ridges on the Nails? 1.3 What Causes Concave Toenails? 1.4 Why Do I Have Dry and Brittle Nails? Why Do I Have Ridges on My Toenails? 5-10% of American’s develop ridges on their nails, so it’s a common toenail condition. Brittle toenails are typically a precursor to developing ridges. Suddenly Becoming Unwell – Heart attack, Stroke, Pneumonia, etc. Multiple factors often interact to cause toenail ridges to develop. For example, a chronically stressed individual who injures their toenails during sports is likely to lead to brittle toenails with ridges. This is because chronic stress slows down the body’s natural healing process. Psoriasis and eczema might not necessarily cause ridges in and of themselves, but if people with these conditions regularly get their nails wet, the imbalance of moisture can aggravate psoriasis or eczema, which can lead to ridges developing on the nails. When trying to determine the cause of toenail ridges, notice whether they appear towards the base or the tip of the nail. If the ridges begin right at the base of the toenail, this would indicate that the damage has been caused recently. If the ridges are localized towards the tip of the nail, this might suggest that the cause happened in the recent past, because nail growth has occurred since that time. Remember, toenails grow at a slow rate of approximately 0.05mm per day, so it can take six months to grow out any nail damage. This means that toenail ridges could indicate an ongoing health concern or one that occurred as many as six months ago. You might still be feeling bemused by the number of potential causes for ridged nails. Studying the direction and texture of the ridges will make the deciphering process a lot easier. We’ll start by defining the differences between horizontal ridges, vertical ridges, and concave nails with ridges. What Causes Horizontal Ridges on the Nails? Horizontal ridges on the nail are a more significant concern than vertical ridges. There are four categories of horizontal ridges – Beau’s Lines, Mee’s Lines, Muehrcke’s Lines, and Lindsay’s Lines. It’s important to distinguish each type of horizontal line because they indicate different causes. If you have Beau’s lines in your nails, you’ll be able to feel a depression in the nail where the line is. This is not the case with Mee’s Lines, Muehrcke’s Lines, and Lindsay’s Lines. Chemotherapy – Chemotherapy is invasive and dehydrating for the nail and can cause many nail changes – including Beau’s lines. Scientists discovered that by measuring the distance between the lines, it’s possible to determine when a patient’s last chemotherapy session took place. The rate of nail growth slows down in cancer patients, so their ridges or ‘Beau’s lines’ may persist for longer than six months. Beau’s lines caused by chemotherapy look like the output of a pulse monitor – the edges are jagged, and there are lots of peaks and troughs in the lines. Stressful Experiences – This is likely due to the intense physiological changes that occur during periods of high stress. Severe Physiological Events or Infections – Pneumonia and heart attacks are both known causes of Beau’s lines in the nails. Rheumatoid Arthritis – Several studies have shown that sufferers are more likely to develop Beau’s lines when their condition flares up. High Fever/Chills – Fever can cause Beau’s lines to occur in the nails. Once the person has returned to good health, the nail should grow at a normal rate, and they should grow out. Diving – Studies have shown that divers are more susceptible to developing this type of nail ridge. Scientists aren’t sure why Beau’s lines occur in divers, but it’s likely to be due to the stressful physiological effects of immersion and pressure. Zinc Deficiency – Zinc is vital for strong nails, and many nail conditions involve a zinc deficiency. In cases where someone eats a healthy balanced diet, deficiency may still occur due to absorption problems. Injury or Trauma to the Nail – Sports injuries or accidents can cause trauma to the nail, which may lead to Beau’s lines. If the lines are isolated to one or two nails, this indicates that the lines have been caused by injury rather than systemic illness. Remain vigilant of the potential causes of Beau’s lines, but remember that toenail ridges don’t always point to an underlying health concern. Unlike Beau’s lines, Mee’s lines are not depressed into the nail. Instead, they are characterized by a horizontal line of pigmentation in the nail. The line appears white and does not disappear when pressure is put on the nail. Renal Failure – Kidney problems can cause various changes to the nails, including Mee’s lines, Muehrcke’s lines, and Lindsay’s lines. Renal failure causes inflammation and iron deficiency in the body, which is thought to have an impact on nail health. Diabetes – Diabetes impairs circulation. The nail matrix needs a reliable blood supply to encourage healthy nail growth, so diabetes patients often develop these lines on their nails. Trauma or Damage to the Nail – Mee’s lines on the toenails may be caused by dropping a heavy item of the feet. These lines look similar to Mee’s lines, but they are situated on the nail bed rather than on the nail. When the nail grows, they will stay in the same place. Muehrcke’s lines are easily diagnosed because they disappear when pressure is placed on the nail. Chemotherapy Treatment – Studies have shown that Muehrcke’s Lines develop in patients being treated for Hodgkin’s Lymphoma. Treatment severely dehydrates the nail bed. Sickle Cell Anemia – This is a severe form of anemia that is inherited. Iron deficiency anemia is linked to many nail conditions, though it is not thought to cause Muehrcke’s lines. Lindsay’s lines are characterized by a horizontal brown band that covers the nail. Unlike Beau’s lines, the brown band is not indented into the nail – it is a band of pigmentation. The brown band usually covers half of the nail, and these bands are more common in fingernails than toenails. Hyperthyroidism – Hyperthyroidism is the reason behind many nail conditions, including Lindsay’s lines and Onycholysis. Onycholysis (Plummer’s nails) occurs when the nail separates from the nail bed. Hyperthyroidism is usually the cause of this condition. 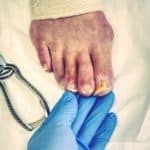 It’s essential to treat Onycholysis to prevent infection growing between the nail and the nail bed. Smoke Stains – Lindsay’s lines on the fingernails can be caused by excessive smoking. Having horizontal ridges doesn’t confirm one of these conditions. There may be alternative causes, or there may be no discernible cause. However, given that horizontal ridges can sometimes indicate a severe disease, it is vital to seek a medical diagnosis when they do arise. What Causes Vertical Ridges on the Nails? Aging – As we age, the moisture in our nails deteriorates. Mechanical Causes – These include injury and trauma, but also over-washing and applying nail varnishes regularly. Genetics – Studies have shown that vertical nail ridges may be an inherited trait. They may occur in the absence of brittle nails, so may not require treatment or intervention. Although they rarely indicate illness, they may indicate the presence of psoriasis or eczema. People go for years without a flare-up of psoriasis, but then suddenly find their nails have become affected. Psoriasis is an autoimmune condition which can cause patches of skin to become red, flaky and itchy. Some people who have psoriasis will develop ‘pitting’ down the middle of their nail. This will give the appearance of a long concave ‘ridge’ running vertically down the nail. Dry, brittle nails can sometimes develop into a condition called Koilonychia – or spooned nails. Rather than developing external ‘ridges,’ the toenail turns inwards, so that it sits like a spoon on the nail bed. The nail will also become whiter in color. Concave toenails are almost always caused by iron deficiency. Chronic stress can amplify the effects of this deficiency by inhibiting proper absorption of iron and zinc from the diet. If you want to determine whether you have this condition, try applying pressure to the nail. If the whiteness of the nail disappears under pressure, this may indicate Koilonychia. ‘Clubbed nails’ are the opposite of concave nails, but they are mentioned here because they can indicate a severe heart condition. Clubbed nails are oversized nails, that can cause the ends of the fingers or toes to appear swollen. They should always be presented to a doctor for a medical diagnosis. Why Do I Have Dry and Brittle Nails? Fragilitas Unguium (dry, brittle nails) is a condition experienced by most people. Brittle nails are typically a precursor for nail ‘ridges’ so it is useful to understand how and why nails become brittle. A nail will be strong and healthy if its water content is about 18%. If the water content drops below 16%, the nail can become very brittle. There is a fine line between healthy, supple nails and brittle, dehydrated nails. Limit Excessive Hand Washing or Foot Bathing – Constantly making nails wet and then drying them again can lead to dehydrated, brittle nails. It’s common for people who have their hands in and out of the soapy water to develop brittle nails. Limit the Use of Nail Varnish – The chemicals in nail polishes or varnishes are dehydrating. Try to Modulate Temperature – Switching between very hot and cold environments can have an impact on the nails. If you are unable to modulate temperature, make sure you cover your fingernails and toenails to protect them against extreme weather conditions. Brittle nails almost always have a discernible cause, though ridges on the nails can leave patients and podiatrists perplexed. We’ll continue to discuss the reasons for nail ridges in more depth. Various vitamin and mineral deficiencies cause brittle nails and nail ridges. For example, iron deficiency anemia can cause brittle and concave nails. Mineral deficiencies are not necessarily caused by a poor diet – they may occur due to malabsorption. For example, consuming too much iron can interfere with proper zinc absorption. So, supplementing with iron can (ironically) cause nail ridges to occur due to a zinc deficiency. It is vital to only supplement iron when this has been recommended by a doctor. Eating a varied and balanced diet will expose your body to as many vitamins and minerals as possible, and good overall health is required for healthy nails. Clinics in Dermatology Journal found that Biotin deficiency is often associated with ridged nails and that supplementing with Biotin significantly improves nail health. Overdosing on Selenium supplements has been found to cause hair and nail damage – including ridges on the nails. Checking your intake of this supplement is vital when trying to decipher a cause for your brittle, ridged nails. Sustaining an injury is a common cause of brittle nails and nail ridges. This factor should always be eliminated before any other explanations are considered. Work accidents or road traffic accidents can cause nail damage and ridges. For example, if something substantial is dropped on the foot, this may cause the toenail to snap in the middle. Assuming the top part of the toenail doesn’t come away from the nail bed, a ‘ridge’ will be left down the middle of the nail. Over time, moisture and infection enter this ‘ridge’ and cause new problems. Many athletes succumb to nail trauma at one point or another. Poorly fitting sports shoes are often the culprit as these shoes squash the toenails, causing them to bend and become brittle. If chronic trauma occurs, this can damage the nail matrix. This may lead to white discoloration marks and ridges in the nails. Picking and scratching at the nails can cause the appearance of nail ridges, particularly if it continues for a long period of time. This can also encourage infections to take hold, so it’s crucial to avoid skin and nail picking. Kidney disease or renal failure is known to cause abnormalities in the nails, especially horizontal lines and ridges (Muehrcke’s lines, Mee’s lines, Lindsay’s lines). Kidney disease is a severe condition with many intrusive symptoms. It is unlikely that ridged toenails would be the first sign of the disease. However, if you have developed ridges in your nails, and have experienced the following symptoms, it’s worth being aware of this condition. Even when people start treatment (i.e., lifestyle changes or dialysis), it can take months or years for ridges in the nails to go away. Cancer treatment is known to impact the skin, hair, and nails. It can also alter the moisture content of nails. It also temporarily halts the growth cycle, so it can take longer than six months to grow out the nail ridges caused by cancer treatment. Other forms of medication are known to cause changes in the nails. Unfortunately, some medication can cause the nail to become very dry and brittle. If ridged nails are caused by medication, it doesn’t necessarily mean that brittle nails are inevitable. There are steps you can take to nourish the health of your nails, which may stop the nail from becoming dehydrated and brittle. These recommendations will be discussed in detail below. Fungal toenails are caused by an overgrowth of yeast or fungi in the nail. The infection often causes the toenail to become brittle and break off in sections. When the toenail does grow back, it usually does so unevenly, so ‘ridges’ may develop in the nail. It is imperative for people with Beau’s lines to keep their foot clean and avoid exposing themselves to fungi. People with Beau’s lines on their toenails should never allow their toes to come into contact with communal areas (i.e., swimming pools, locker rooms, gyms). Both fungal nail infections and brittle nails are exacerbated by excess moisture. It is important not to over wash the hands and feet, and always ensure they are dried thoroughly. Nail ridges are most commonly experienced by older people and approximately 60% of people over the age of 70 will experience brittle nails. Older people are more likely to develop fungal nail infections due to reduced mobility and impaired immunity. Circulation becomes impaired with age, so the nail matrix is no longer able to function as effectively. Moisture levels in the nail become dysregulated. At the same time, the rate of nail growth is significantly reduced, so nail ridges stick around for a lot longer than six months. Nail Pitting – small dents in the nail occur. Often these are concentrated in a vertical line down the middle of the nail, but they can occur anywhere on the nail. Thickening of Skin – This characteristic distinguishes nail psoriasis from other nail conditions such as fungal nail infections. The skin underneath the nail tends to thicken so that the nail almost moves away from the nail bed. There are prescribed treatments available for psoriasis, though keeping the nail hydrated is also likely to prevent ridges and pits from occurring. Conditions affecting the skin, hair, and nails often have a partly psychosomatic basis. This may be because people who are chronically stressed are less likely to take care of their bodies. It may also be because stress impacts the immune system and impairs its ability to fight disease. Studies have also shown that nervously rubbing the nail can cause a ridge to develop. This most commonly occurs on the thumbnail, but it may occur on any of the nails. Brittle, ridged nails can, in themselves, become a source of stress because many people feel ashamed or worried about them. 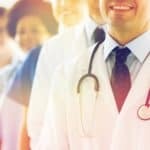 However, it’s possible to regain control of this situation by accurately diagnosing a cause, and then determining an effective treatment plan. Ideally, moisturizing should be performed daily to strengthen dry and brittle nails. A review by Tibb Institute found that moisturizing nails is an effective treatment for brittle nails. It often halts the development of ridges on the nails. The causes of toenails with ridges may run a lot deeper than mechanical or external factors. Nonetheless, it is possible to encourage better nail health by preventing brittle nails, avoiding fungal nail infections, and treating nail injuries promptly. What Causes Cracked or Split Toenails? Can Toenails Indicate a Health Problem? What Are the Causes of Nail Separation from the Nail Bed? What are the Causes of Sore Skin around the Toenails?